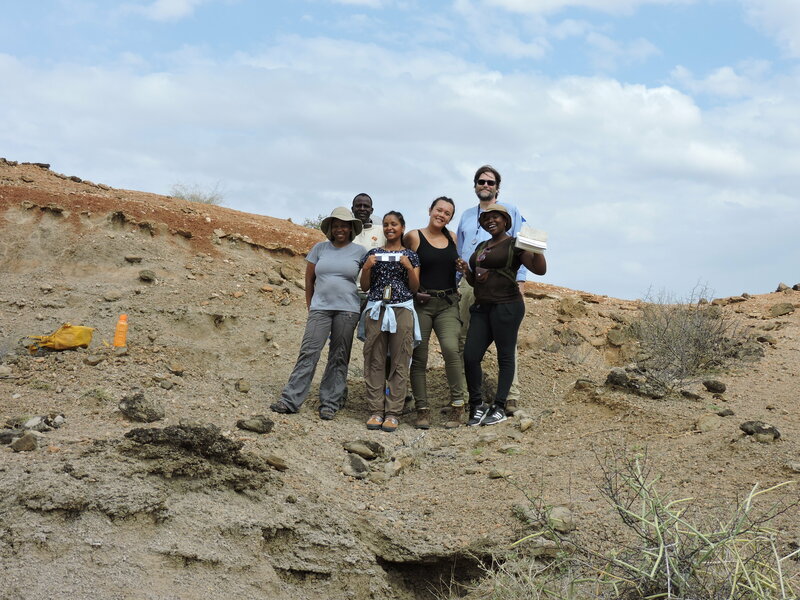 After staying the night in Lothagam’s Nawata river beds, professor Craig Feibel, TBI students and staff continued their exploration of the site’s complex geology and terrain. 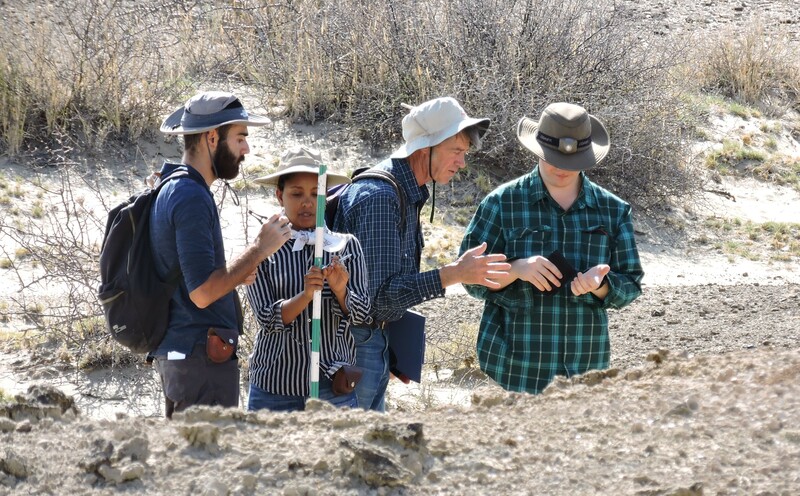 Temperatures during the two day excursion were sometimes as high as 115 F, but students were able to navigate a great portion of Lothagam’s exposures. 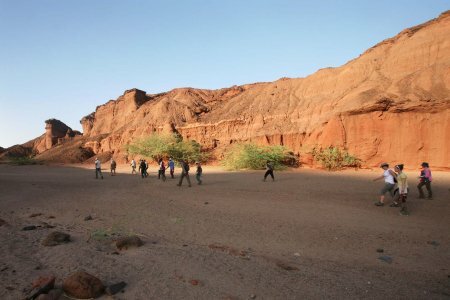 Below, students hike through the lower and upper Nawata formations before making their way to the Nabwal Arangan watering hole. 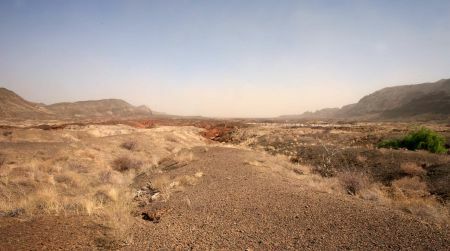 A small sandstorm blows into the valley from the northeast at Lothagam. 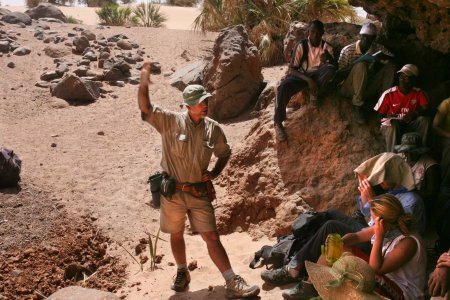 After a quick breakfast, Professor Craig Feibel led students back into the Nawata streambeds, which are dry most of the year. 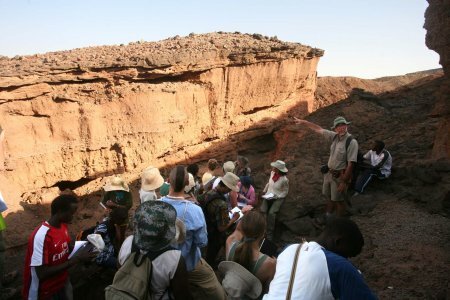 The stream and its tributaries cut a path through Miocene river and floodplain deposits, such that while walking upstream students effectively progressed through millions of years of geological history, trapped in stone. 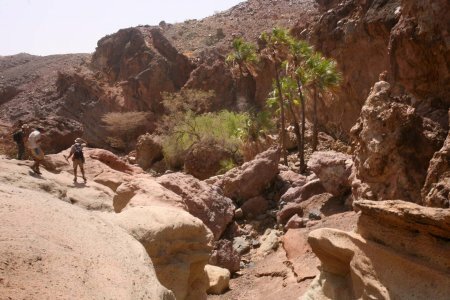 Students make their way along the stream bed, still shaded by the tectonic horst to the east. 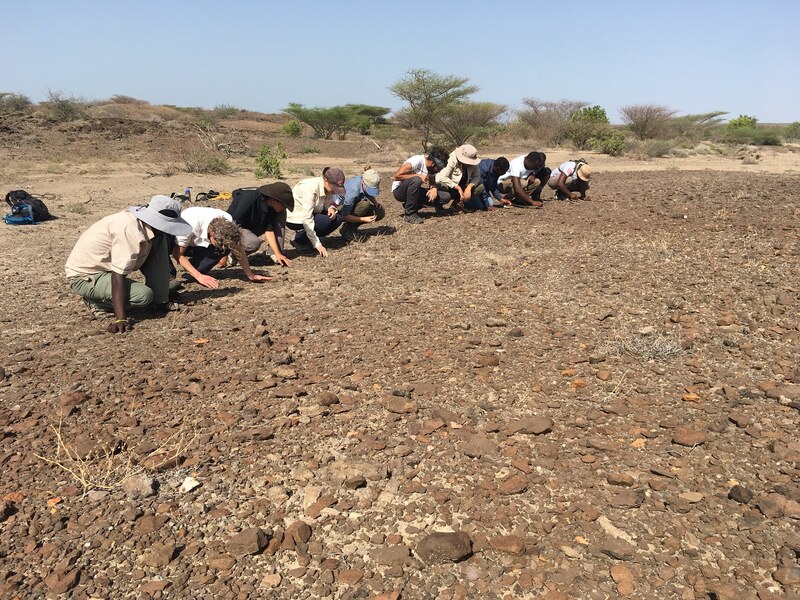 While walking in the early morning students found that water holes, wholly dry the day before, were slightly damp at depth. Locals use these holes to supply themselves and their herds with water, however the ongoing drought has left Lothagam almost deserted. 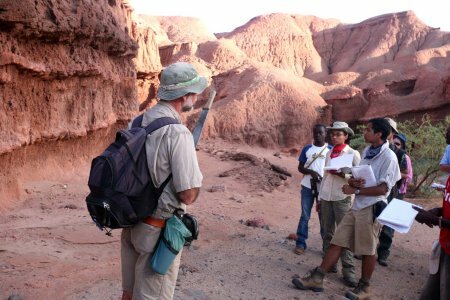 Craig reviews the stratigraphic sequences of the Lower Nawata as Anakoli, Kelly and Alec look on. Hyena footprints in the sand. 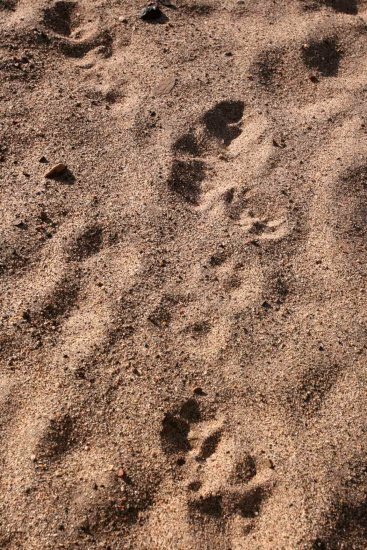 While we did not see them during the night, Hyenas had retraced our steps through the streambeds, leaving only footprints behind them. We could not see them from the entrances of caves, and did not venture inside. 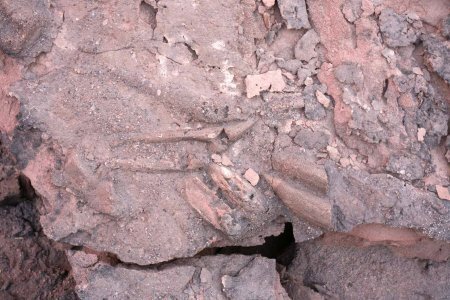 Craig Feibel recalls the discovery of ancient footprints uncovered in the Nawata formation. Large hoofprints have been preserved by the cementation of sediments that covered them 8 million years ago. 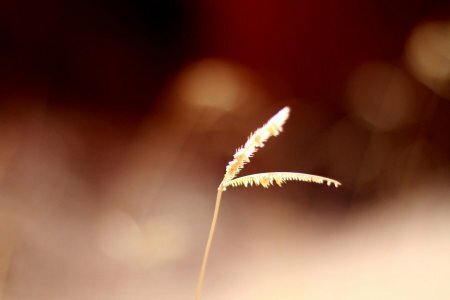 A nawata grass growing from the dry streambeds of its namesake. The local people call this grass, Cynodon dactylon, "Nawata," and because of its presence gave the stream in which it grows the same name. Meadow rests after returning to camp. 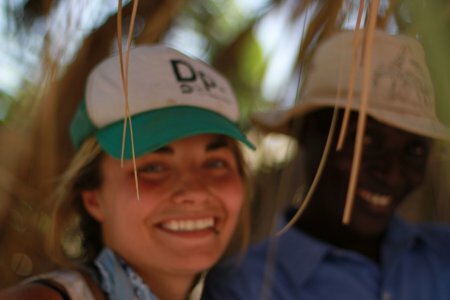 Mandy and Joseph enjoy the shade before heading back out into the field. While some are working, others show less enthusiasm. 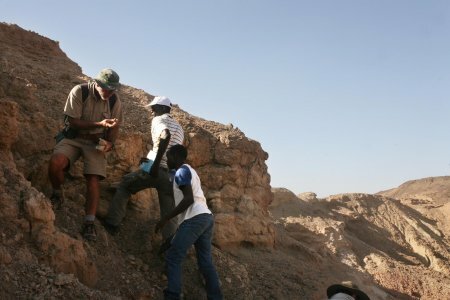 Professor Craig Feibel holds up a piece of diatomite for David and Anakoli. 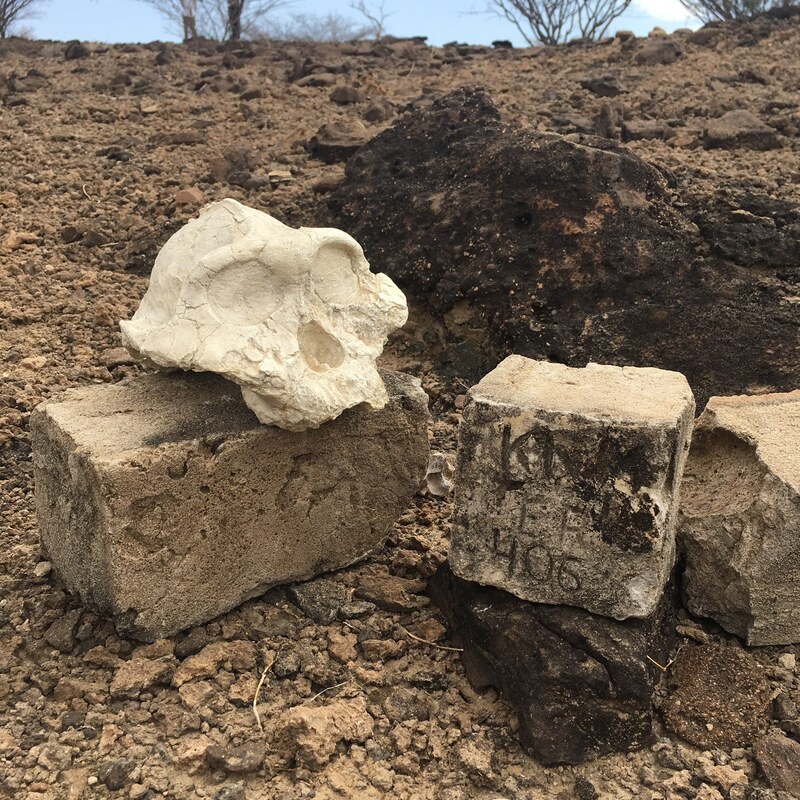 Back in the field and headed south, TBI Fieldschool students found a thick layer of diatomite formed during the Galana Boi, approximately 10,000 years ago. This area, the deepest section of a large and rapidly formed lake, collected the silica debris of millions of small algal diatoms and deposited them where they rest today. Because they may respond to even fine ecological changes, diatoms are sometimes used in geology to reconstruct the history of environmental change. Dust blows in from the north of Lothagam. As we began our hike towards the Nabwal Arangan water hole, a dust storm blew in from the deserts to the north, obscuring the horizon. 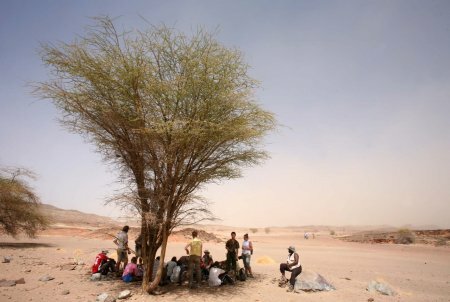 After a long hike, students take shelter and water beneath the shae of an Acacia. Approaching the watering hole, palms were seen sprouting from rainy season canyons. Ben finds water at Nabwal Arangan. Even during times of severe drought, the Nabwal Arangan watering hole can be relied upon for freshwater, though you may need to dig deeply. Sites such as these help keep local peoples and their flocks alive. 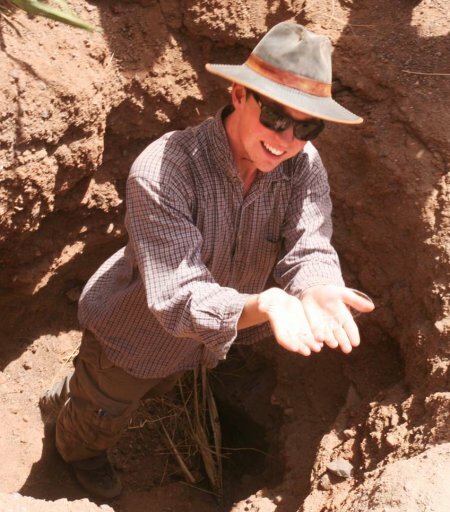 Professor Craig Feibel explains how precious water may be in an environment such as that found at Lothagam. 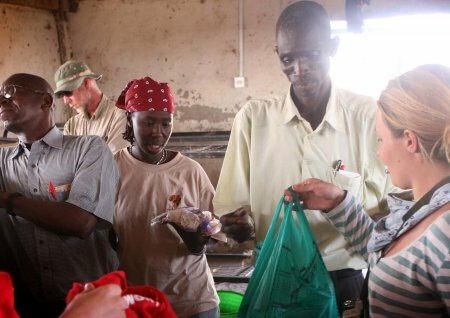 Ikal and Mandy bring supplies to a local school at Kerio Village. 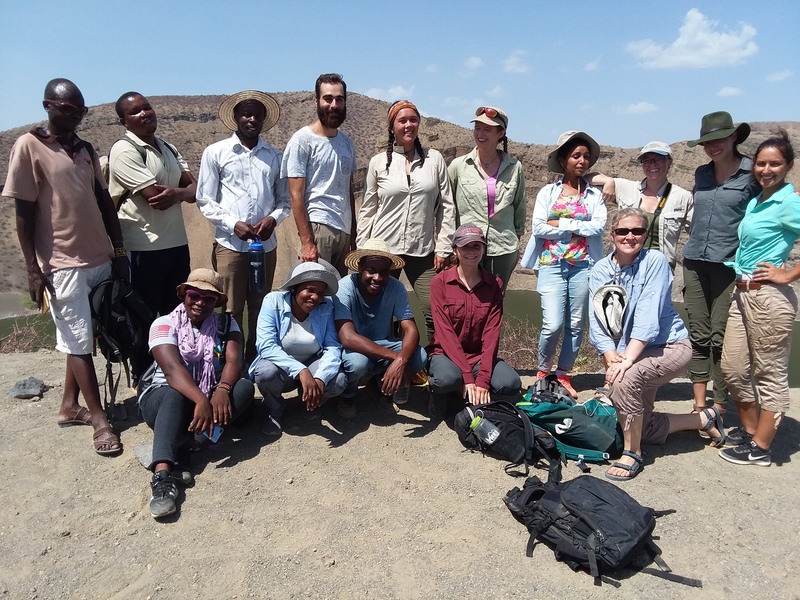 On the way back to TBI, Ikal and a number of Stony Brook University students organized a stop to visit the Kerio Village primary school, and bring supplies for the students. Access to basic water, sanitation, electricity, and school supplies remains limited in this region, despite the best efforts of teachers and pupils. 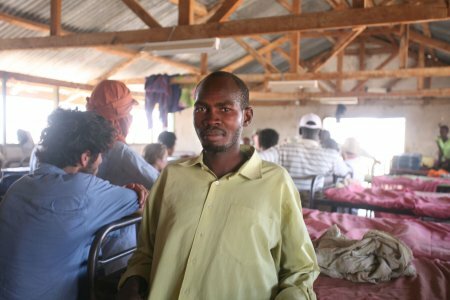 Daniel, a primary school math teacher, stands in the Kerio Village school dormitories.